The Centre for Sport and Sustainability collaborates with UBC Athletics & Recreation to measure the environmental impacts of their activities. UBC Athletics & Recreation aims to develop a comprehensive environmental strategy in line with UBC’s mission to work towards sustainability. As an organization with 100 full-time employees, 20+ sports venues, 27 varsity teams, and that hosts 200 events with 60,000 spectators annually, UBC Athletics & Recreation is an important part of campus activities. UBC Athletics & Recreation seeks to better understand their major impacts, mitigate their footprint, and develop behaviour change strategies to influence stakeholders such as spectators, athletes and sponsors. Executive Summary: This study was commissioned by UBC Athletics & Recreation as an extension of the pilot study “Measuring the Carbon Footprint of a UBC Thunderbirds Men’s Basketball Game“. 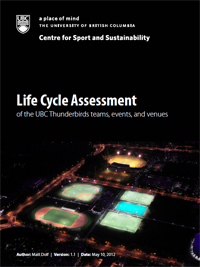 The goal was to carry out a Life Cycle Assessment (LCA) and provide UBC Athletics & Recreation with a tool to assess and manage the environmental impacts of their varsity “Thunderbird” teams, venues, and events. A principal aim of this study was to apply rigorous evaluation methods in a resource-efficient manner to identify major impacts from UBC Athletics & Recreation’s operations, stakeholders, and supply chain. The study uses the IMPACT 2002+ LCA method to determine cradle–to–grave impacts across the environmental damage categories of climate change (Carbon Footprint), human health, water withdrawal, ecosystem quality, and resource depletion. The unit of analysis was the provision of an entertainment / athletic experience to participants of the UBC Thunderbird sports events for the 2011/2012 season. The results showed a total annual footprint of 8,300 tonnes of carbon dioxide equivalents. The largest contributors were venues (72%) and travel (24%) — with food, office, waste, communication, and accommodation combining for the remaining 4%. The results, data, and methodology presented in this report have been incorporated into the Quantis SUITE 2.0 LCA software tool. General recommendations for impact mitigation opportunities and ongoing data collection strategies are also included. UBC Athletics & Recreation will use this to track and report on environmental performance. This approach represents a new level of sophistication for sustainability management and assessment of the events industry. 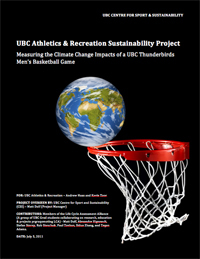 Executive Summary: As part of its commitment towards engaging in sustainability best practices, UBC Athletics & Recreation commissioned the UBC Centre for Sport and Sustainability to carry out a pilot study of the climate change impacts of a varsity ‘Thunderbirds’ basketball event. The Life Cycle Assessment Alliance, a cross–faculty collaboration of UBC grad students applying LCA in a variety of fields, measured impacts for the most significant event organizational sectors: travel, accommodation, food, materials and waste, venue operation and infrastructure. A key aim of this study was to apply rigorous evaluation methods in a resource–efficient manner that estimated major impacts by using easily obtainable activity data. A hybrid LCA method combining both input-­‐output and unit process data was applied to measure climate change potential. The unit of analysis was all services that went into providing an entertainment experience for participants over the four–hour period of the event (food, warmth, transport, safety, etc.). The results showed a total of approximately 5 tonnes of carbon dioxide equivalents from the five event sectors under study. The major impact came from travel (73%), followed by food & beverage (12%), accommodation (11%), venue operation and infrastructure (3%), and materials & waste (1%). 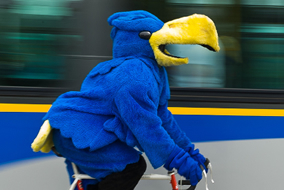 A sensitivity analysis showed that the travel impacts of this event were actually significantly lower than an average UBC basketball event since the visiting team came by bus whereas most events require travel by air. This report includes recommendations for GHG mitigation opportunities for future editions of this event. It also recommends that a robust baseline for all UBC Athletics & Recreation events be developed to set specific targets and measure performance. A more comprehensive sustainability management system that addresses other environmental, social and economic issues is also recommended.